The girder frame is one of the most elegant of Meccano parts, but one of the least expected. It doesn't match the half-inch width of any other Meccano part introduced until the narrow strips finally arrived in 1962. Girder frames are absent from the "New Meccano Parts" leaflet of September 1919 (printed in October), but are shown in the Meccano parts listing of December 1919. We have to be careful with these dates, however – the new parts announcements are notoriously out of date and we have to wait until the March 1921 issue of the Meccano Magazine for the girder frame to be announced along with other "New Meccano Parts". The girder frame's most common appearance in Meccano is in the feet of the Giant Block-Setting Crane, Supermodel number 4. 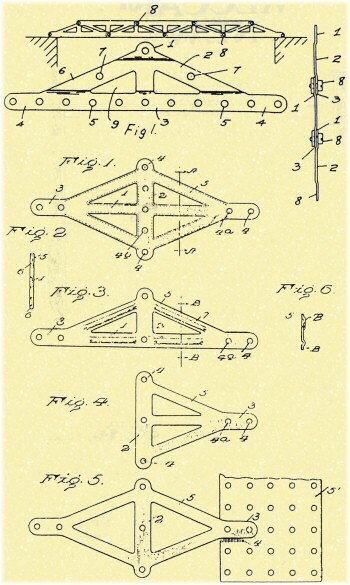 However, it was originally conceived as a component to be used repeatedly to form something like a braced girder, as can be seen from the drawing at the top of this extract from the patent application in 1920. The top diagram, and the side view shown top-right, also explain the stepped nature of the girder frame, intended to allow this composite girder to remain in a single plane when assembled. A photograph of three girder frames placed together in this arrangement is shown below. The diagrams further down show all sorts of variations on the original girder frame design, none of which were put into production. The girder frame appeared in the 1919 "Inventor's Accessory Outfit B", and subsequently four were included in the largest outfit 7 from its introduction in 1922. They were dropped, however, from this outfit after 1928. This coincides with its first appearance in the Supermodel 4 leaflet, which perhaps would have maintained its sales as a spare part. The use of the girder frame in Supermodel 4 is certainly the reason for the continued strong demand for this part to this day. Although it never appeared in a Meccano Outfit again, the girder frame remained as a spare part right through to at least 1978. Tim Edwards' parts lists show it as being discontinued in that year, although a very small number are known in dark blue. This is not a common colour, though. The post-Binns Road listing of 1982 still lists part 113, so it seems possible it was not discontinued, but spare parts were notoriously difficult to find in dark blue. Introduced in 1919, this part went through the usual finishes from nickel through to dark blue that would be expected of any Meccano strip-like part. No changes appear to have been made to the part in that time. To the right, you can see a variety of stampings of the first nickel-plated versions of this part. 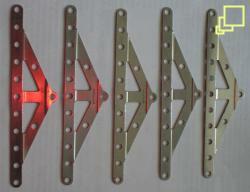 They include MFEA, Meccano in various orientations and the right-most example with no stamping. Just the one oddity here – an example from John Bader of a nickel plated girder frame completely flat (without the steps in it). The only one we've seen, this is most likely a manufacturing mistake. The above image show packs of three girder frames in a spare parts box, in medium green (top) and light green (bottom), as shown by the change from yellow to light green label. Note that the box is considerably longer than it needs to be (long enough to fit a 7½'' strip), and that they are inexplicably packed in threes! Perhaps this is a cunning plan to force a dealer to buy two packs when the customer wants four parts? I agree that the girder frame is unusual. It is far too unsubstantial for use in the titan crane ( it makes the bottom end far too spindly)and I think it's use may well have been dictated by the company in order to boost sales of the component. All my dark blue girder frames (I now have 10) are all stamped Meccano Made in England. Although there are some DB parts which were over painted zinc, none of my girder frames have zinc underneath them. I'm guessing, are yours are on EBAY at the moment Andy? I have 8 girder frames in dark blue but I can't tell if they're repaints or originals. There are a mixture of Meccano only and Meccano with Made in England underneath. Does the stamping help date them one way or the other? anyone else notice that fig. 5 looks almost identical to the spring that was used to keep the reels in place in some of the older VHS video tapes? I have 7 dark blue girder frames, including one in its original binns road packaging. I have a flat girder the same as John Baders but in mid green stamped, "MECCANO MADE IN ENGLAND". Will send a picture if you wish.